Clinical variant of psoriasis vulgaris characterized by drop-like, erythematous, scaly plaques measuring from 3 to 10 mm in diameter distributed diffusely over the body, with accentuation of the truncal areas and the proximal extremities. It characteristically occurs after a streptococcal infection, especially in children or young adults. Stress can cause psoriasis to flare for the first time or aggravate existing psoriasis. Scratches can all trigger a Koebner response. The Koebner response can be treated if it is caught early enough. Certain medications, like antimalarial drugs, lithium and certain beta-blockers, are also known to cause people's psoriasis to flare. Other triggers may include weather, diet and allergies. Triggers will vary from person to person and what may cause one person's psoriasis to flare may produce no reaction in another individual. Guttate psoriasis is characterized by small red dots (or drops) of psoriasis. It often appears on the trunk, arms and legs. The lesions may have some scale. Guttate psoriasis frequently appears suddenly following a streptococcal infection or viral upper respiratory infections. There are also other events that can precipitate an attack of guttate psoriasis: tonsillitis, a cold, chicken pox, immunizations, physical trauma, psychological stress, illness, and the administration of antimalarial drugs. Centro Nacional de Investigaciones Oncologicas News: For the first time, researchers have linked psoriasis to the risk of widespread bone loss and describe how the protein IL–17 acts as a 'messenger' between the skin and the bones in paper published in the journal Science Translational Medicine. IL–17 inhibitors, some of which already on the market, could simultaneously address skin inflammation and associated bone loss. These results recommend monitoring the bone mass of patients with psoriasis to select the most appropriate treatment. The study has potential implications in other autoimmune diseases such as inflammatory bowel disease. Organ des Zentralvereins Homöopathischer Ärzte über klassische Homöopathie. 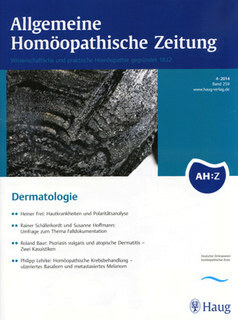 Die älteste noch erscheinende homöopathische Zeitschrift. The skin is the chief organ holding together body and soul. The skin breathes, absorbs nutrients, metabolises, and excretes. It is also called the “third kidney” or the “third lung.” Through fever and sweating, it demonstrates the integrity of the immune system. Every chronic illness begins with the skin. If the illness heals from the inside outwards, it can leave the body via the skin. 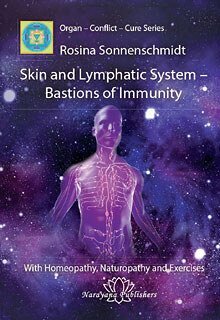 In the final volume of the now legendary series Organ – Conflict – Healing, Rosina Sonnenschmidt demonstrates the great significance of the skin and lymph system for health. She explains the underlying conflicts of many skin diseases such as herpes of the lip, skin fungus, erysipelas, eczema, psoriasis, shingles, vitiligo, scleroderma, and skin cancer. The deterioration typically found in diseases of the lymphatic system such as a tendency to infection through to malignant lymphomas is also discussed. Holistic therapy comprises conflict resolution, tips on nutrition and strengthening of the immune system, naturopathic measures such as foot baths, light and colour therapy, as well as a wealth of well-known and also unusual homeopathic remedies such as Elaeis, Polio, Desoxyribonucleicum acidum, and specific gut nosodes. The example of the skin in particular shows how crucial it is to not just treat an illness locally. A chronic illness is only healed when the skin can once more demonstrate its immune response through fever and sweating. Can this information have any relationship to psoriasis? DISEASE. Oppression of chest. Writer's cramp. Feeling as if something rolling about. Fluttering in region of ovary. Pressure in neck of bladder; urging to urinate. Sense of swashing in bladder. Soreness in urethra; feeling as if urine could not be retained. Urine contains mucous corpuscles and epithelium, albumen and casts. Cramp in fingers, thumb, and wrist when writing-soreness extending along flexor carpi ulnaris. Compare: Apis; HELONIAS; MERC, COR. ; PLUMBUM.